Hello everyone! 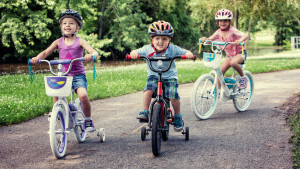 It’s that time of year and we are in need of as many extra kids bikes as you can donate! We’ll be accepting bikes for this year’s Bike drive where we work directly with the Black Fire Service Professionals of Alexandria to take in donations, fix them up and hand them out on December 19th to boys and girls who can’t afford bikes. So if you have an old bike or if you kids are ready for some new ones, bring the old one down for a tax deductible donation that will bring a smile to a local kid ‘s face.